Message 67533 - Posted: 25 May 2018, 6:42:52 UTC - in response to Message 67407.
perhaps the errors are caused by overheating if doing too many WUs. AMD specs for the S9150 require 20 cfm at 45 degree max inlet temps. Message 67534 - Posted: 25 May 2018, 7:41:33 UTC - in response to Message 67533. Yes, I saw that, but even in my garage it never gets that hot. The attic on a hot day probably hits that 114f or higher in the middle of the summer. My S9100 has only a single 8pin unlike the s9150 and less memory. I have ECC enabled and have never seen an error. There are no MW errors (invalids) when running one concurrent task at a time. The MW invalids increase exponsntially as more concurrent tasks are added. Currently it is in the garage due to the 20cfm (or higher) blower as it makes too much noise. 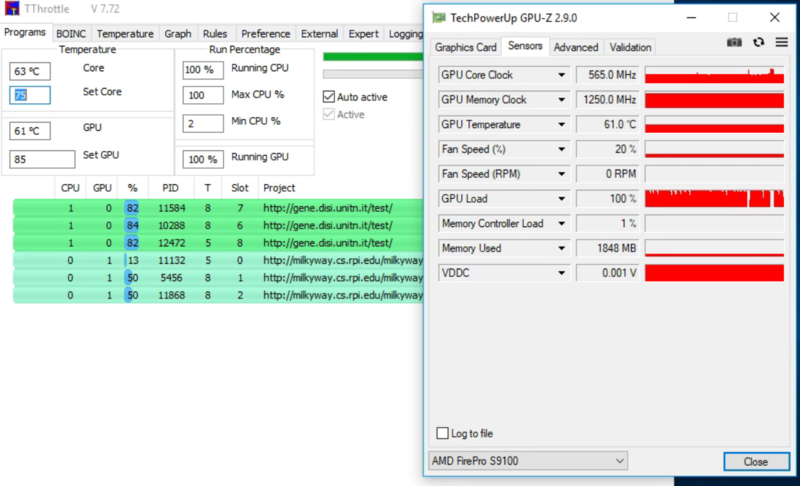 gpu-z measured temp is 65c for the S9100 and slighly less for the Q9550s cpu as reported by tthrottle. It is running 3 WUs at a time and ratio of valid to invalid stays about 500:1 When I was running 10 concurrent tasks I was getting an 8:1 ratio and that test was run inside with A/C probably 75f way under 45c. Message 67535 - Posted: 25 May 2018, 7:55:20 UTC - in response to Message 67534.
did you by chance notice how hot the VRMs were? Message 67536 - Posted: 25 May 2018, 15:21:56 UTC - in response to Message 67535. Unfortunately, S9xxx information is not as complete as most HD7950. In addition to missing measurements, the clock frequency on my S9100 is not fixed at its maximum value like the S9000 or HD79xx series. It varies with load but it does jump to its minimum (300) with no load like the other AMD boards. Just does not stay at 800 like one would expect. Maybe this is by design. Note the s9000 (equivalent to HD7950) is locked at 900, its maximum. According to AMD docs, the 9100 supports OpenCL 2.1 but is being used at 1.2 according to the MW stdout report. My guess NM did not test their program against this board to optimize their code but I dont blame them as this is not a widely used board as it is designed for servers and has no video output. The S9000 does have video but not the 9100. [EDIT] While both HD79xx and S9000 are the same basic chip, I have given up trying to get them to co-exist on the same motherboard. Message 67540 - Posted: 27 May 2018, 5:01:39 UTC - in response to Message 67536. On paper, s9150s and s9100 has so much potential with milkyway@home. hopefully you guys can figure out what causes the invalids. Message 67546 - Posted: 29 May 2018, 2:08:31 UTC - in response to Message 67540. Found out a couple of things. (1) a new driver released 5-24 and (2) Found out how to better identify the S9xxx which is not being recognized properly (requires binary patch to exe). 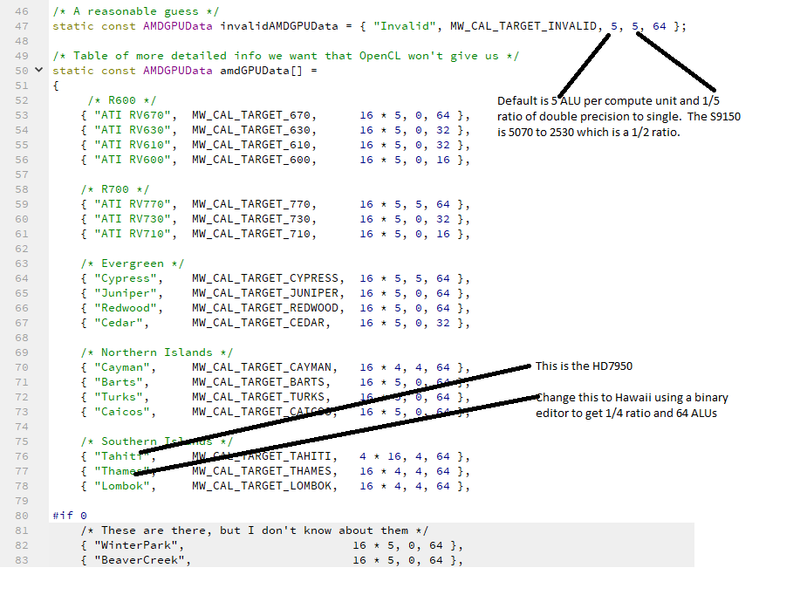 I looked at the source code and spotted a deficiency:"Hawaii" was missing from the list of AMD boards. S9xxx boards are hawaii series. This can be fixed (at least for me) by changing "Thames" to"Hawaii" as I do not have a Thames graphics product. Anyway, after all this work, I still do not have TESLA performance, but it is running about %20 faster. I suspect there are other factors involved, but at least my S9100 is better identified. I am processing 4 WUs at a time on both S9100 and S9000. Each WU is bundled as either 4 or 5 units. When I compare performance improvement I have to make sure that i am comparing the same bundles. Message 67551 - Posted: 30 May 2018, 0:38:48 UTC - in response to Message 67546. Isn't FP32 to FP64 ratio 1/2? Message 67552 - Posted: 30 May 2018, 2:29:27 UTC - in response to Message 67551. Message 67553 - Posted: 30 May 2018, 3:49:36 UTC - in response to Message 67552. Yes =) I'm trying to learn source codes, but I'm a noob compared to you. You're on to something! Will you test it and see if you get any errors? Your work rate is probably almost double compared to the original setting. Definitely a Kepler Titan killer right here. Nice investigative work Beemer. I will need to look into this more and likely attempt the same patch you have just discovered. Message 67734 - Posted: 28 Aug 2018, 12:04:05 UTC - in response to Message 67727. Has anyone tried to PM the project admin or developers about this? 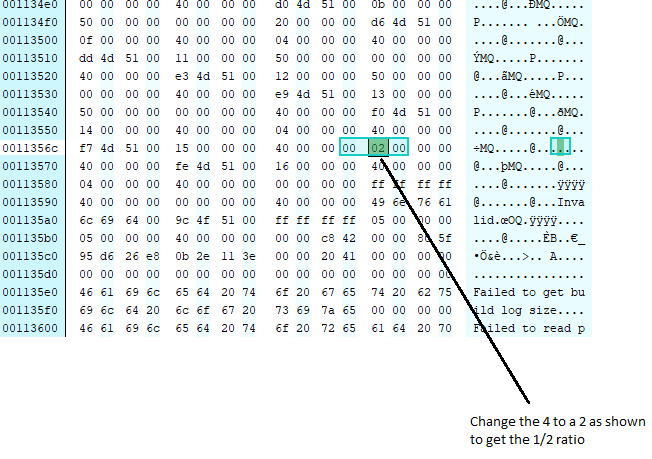 Thanks to BeemerBike making the above changes to the binary as described above is easy enough, but I assume the binary will be overwritten next update. I just did, will post back if there is some news. I just got pointed over to this thread. Wow you guys did a deep dive into this issue. Thank you for that. If someone already has the fix for this coded up, you can make a pull request on the source on Github. If you do that, I will do some internal testing on the new code and push it out to users sometime next week. If you do not want to do that, I will read through this thread and try to implement the fix myself. Hi everyone, I created a PR on github regarding to this issue. Vendor:     Advanced Micro Devices, Inc. So is the MilkyWay code fixed to include "Hawaii" based GPUs now? Or is this still a manual fix? Message 68175 - Posted: 20 Feb 2019, 3:46:44 UTC - in response to Message 68160. It's in the public github source repo but not in the public binary release yet. I compile and overwrite the current installed binary with this latest one. Message 68176 - Posted: 20 Feb 2019, 15:03:02 UTC - in response to Message 68175. I never got cmake to work but will look at this again. As you got it working then my guess that not all code was available was wrong. which make a total of 20 supposedly concurrent tasks. My guess (from an actual experience I had years ago) is that those 5 tasks are not completely "unzipped" before the coprocessor starts on them and the situation gets worse as more tasks are added. When I was running 20 concurrent (total of 100 on an s9100) I got a huge amount of valid tasks, but the number invalids was so high the total throughput was worse then when 4 were running. However, I could have left it running like that but it would have caused delays in validation for other users I was a wingman to. @BeemerBiker: There is thread somewhere about Nvidia Titan V running MH. In that thread, the author mentions about each WU uses about 1.5GB of VRAM. So you can run about 6 WUs on a S9100 (12GB) or 8-10 WUs on S9150 (16GB).